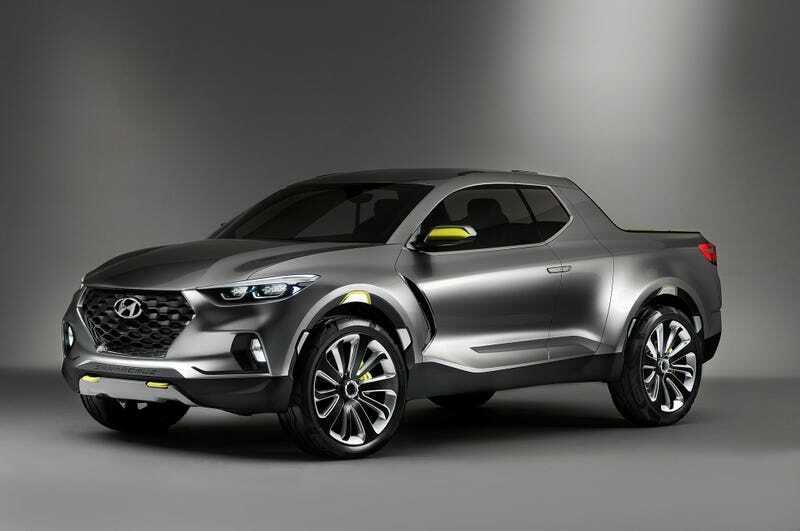 If you’re a regular denizen of the internets like me and you occasionally read what attempts to pass for automotive news on the web, you may have heard about the Hyundai Santa Cruz. A half car, half truck, half MicroMachine conglomeration that for reasons that are beyond my understanding is supposedly considered “cool.” However, the Hyundai Santa Cruz is not cool, probably won’t ever be sold here, and will never deliver that sweet El Camino-y goodness people are looking for. If you’re one of those people looking to fill the void left by your uncle’s “totally bangin’” Ford Ranchero, I am truly sorry, but it ain’t gonna happen and I am going to tell you why. You see, you may have noticed that in order for a business to continue its existence, they have to do a little thing called turn a profit. Now, if you’re a car company, this can sometimes be difficult, particularly with all those brown, manual, diesel wagons that you’re throwing together on the old assembly line. Just to give you an idea about how slim that can be for some manufacturers, “old” General Motors (as in 2006 GM) was making across its entire model lineup, approximately $200 per vehicle. Per vehicle! To compare, Toyota made approximately $2,000 per vehicle at that time but both examples illustrate the point that selling cars can sometimes be a pretty tight business and that “old” General Motors was dumb. But, but, but, but, but Hyundai is a totally DIFFERENT company and not nearly as wasteful as those giants GM and Toyota, says the man in the corner with the ponytail ready to plunk down his hard earned cash on a warmed over Subaru Baja. Well my good sir! I have news for you! Hyundai is currently the fourth largest automobile manufacturer in the world, larger than Ford and even FIAT Chrysler. I can guarantee that they have the same issues with profits that all automakers struggle with. However, Hyundai has a bit of a reputation as an economy car maker and through their subsidiary Kia, they have a pretty good station in the basement of the auto market which probably has saved them some money through the years. I mean, you can’t continuously churn out vehicles like the Accent and expect not to make some money off of that. They probably cost whatever the bulk price of PVC is at this point. I mean, do they just stamp the Accent out? Also, what exactly are you Accent-ing? Wait, oh, sorry about that, where was I? AH, yes, Hyundai making money. So, Mr. Ponytail, why should you care about all that cost-savings from stamping out Hyundai Accents and Kia Rios? Recently Hyundai decided to pursue the act of making money disappear by introducing the wildly successful Genesis Motors brand. Just kidding. Hyundai spun off their mildly successful full size sedans into their own brand because the crappiness of their own badge slowed sales down. This is important! The Hyundai badge might stand for cheap and reliable crap-cans but when they decided to move up-market, it didn’t work out too well. Making it in the luxury market is insanely expensive and if you want to guess where product development money is going to be headed for the next few years, it might not be a bad guess that the Genesis brand will be sucking up a healthy chunk of it. But even more damning for our star-crossed car-truck are realistic sales numbers. Since the Santa Cruz will be competing against other actual trucks, lets take a look at some sales numbers shall we? Because, let us all be honest here, while the unwashed masses of Jalopnik may clamor for it, does the world really need another Subaru BRAT?